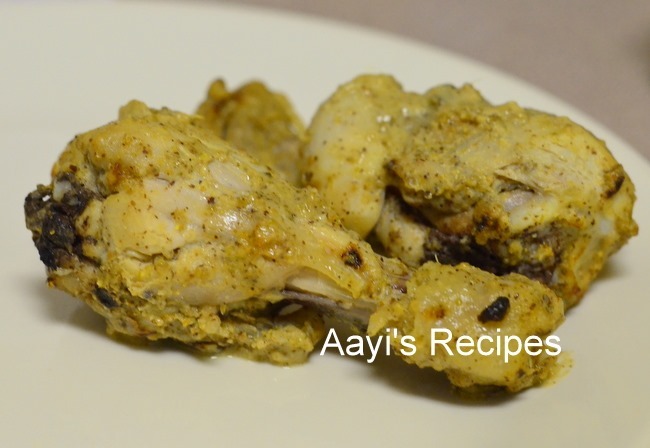 Well, this is not the traditional chicken achari recipe, but my cousin Anirudh’s creation. Few months ago, we were chatting on google chat – he was in Germany and I was here in Kansas. It was one of those catch up sessions where we chat once in a while and catch up on what is going in our lives. That day I asked him what he was eating in his hostel. He mentioned he had prepared a chicken curry that day. He then said he has a recipe for me. He prepares this frequently and it is super hit with his friends. He also said he has become an expert in the kitchen and next time we meet, we will have a cook off! He was so confident that he said he will surely win :). Anirudh uses actual achaar(pickle) in his recipe. He said he had a lot of pickle in his pantry and didn’t know what to do with it. He started applying it to chicken and grilling it in oven. He usually uses a Tamil pickle (he forgot the name of it). He liked the taste so he kept changing it to get to this recipe. It sounded so interesting to me. Instantly I knew how to finish off some of chili pickle that was sitting in my pantry begging to be finished. 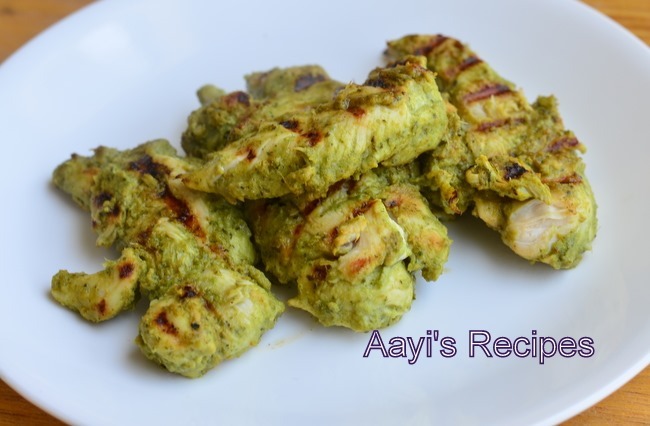 Anirudh uses chicken legs (tangdi) for this, since I almost always buy boneless chicken, I use that to make this. I tried my own variations to this recipe and it always comes out perfect. 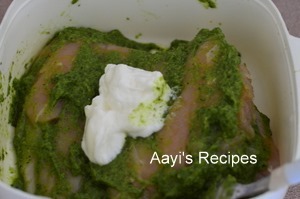 Make a paste of coriander leaves, ginger, garlic, mint leaves, pickle masala, chilli powder, salt. Make some deep slits on the chicken. 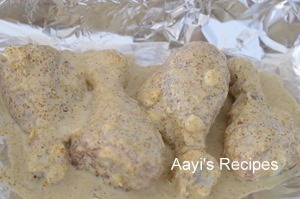 Apply the paste and yogurt to chicken and leave it aside for about 30mins. Grill in the oven, when it is almost half done, pull out and apply some lemon juice and put it back in oven. Grill till done. (I grill the chicken on my cast iron grill pan). Instead of using pickle, I use fresh (Konkani) pickle ingredients directly. 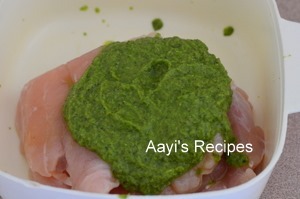 I leave out coriander and mint leaves so that chicken gets all the flavors from pickle masala. Heat oil and add mustard seeds. 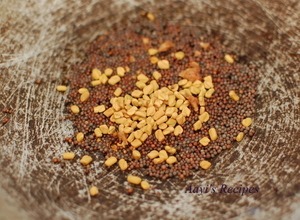 When they start popping, add fenugreek seeds, asafoetida. 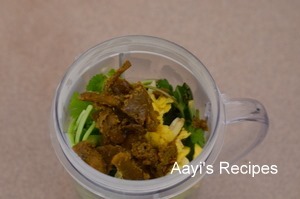 Make a paste with green chillies, ginger, garlic. 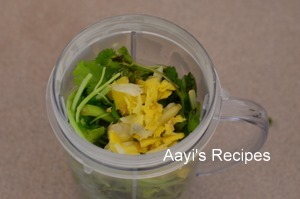 Â Here instead of making the masala, you can just add some ready pickle masala and skip the whole grinding process. 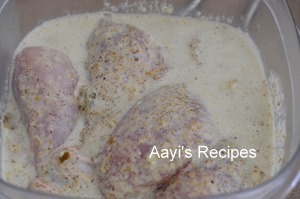 Apply the masala, yogurt and salt to chicken and leave it aside for about 30mins. 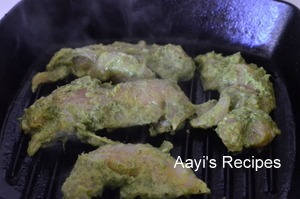 Grill in the oven, when it is almost half done, pull out and apply some lemon juice and put it back in oven. Grill till done. (or grill on a grill pan). Sounds so simple, looks so good.. will try this! Thank you so much! Have you tried adding pickle oil to puffed rice mix ? It tastes so good. How long do we need to grill it in the oven? I was attarcted by your idea of using the cast iron grill pan. I have a heavy duty cast iron grill pan. Used it twice and both times the chicken kebabs got stuck to the base and everyhting was ruined. Can you tell me how you use the pan? Is there any preparing to be done to ready the pan? Am I missing soemthing? Your experience will help a lot as I really do not wish to throw this pan away. After you wash the cast iron grill pan every time, make sure to dry it completely (I usually warm it up a bit to remove moisture) and then apply a little oil to it (I just take one tea spn oil in the pan and spread it with help of a paper towel). This is the most important step in using any cast iron pan. This way the pan is always ready to use and it becomes almost like non stick !!!. Before grilling, you have to make sure the pan is heated well. If you keep chicken before that, it will get stuck. Thanks Shilpa, makes sense. That means after use, one oils it and leaves it thus until next use. Makes more sense. Thank you for this tip! And the heating of pan before using is also a good point. 🙂 Could you plz tell which brand pickle you used & color of the pickle also .. Is it green or red in color 🙂 ? Thank you.. Clever use of pickle for kababs…Very creative idea. too good… and looks yummm, delicious… perfect for my type of lazy girlz out there… 🙂 just put together the handy things .. 🙂 gonna try this one! !